STOP LOOKING FOR ANY OF TEAM AND HIRE ROCKY TOP!! My (now) husband and I got married this past November, we are total foodies.. we looked high and low for a vendor who would be willing to put up with our perfectionist palate. Vicki for the win!! I can not say enough good things about Vicki and her team, I loved her so much I almost didn't want my wedding day to come so I could continue eating amazing food and working with her. We must have changed the menu about 5 times, requested special meals, and even added a vegan meal for one of our guests last minute! She gave us everything we asked for and always with a smile! People are still talking about how delicious our food was and commenting it was the best "wedding food" they have ever had! Rocky Top was amazing throughout our entire wedding planning process! Jeff was very communicative and accommodating. The food and beverages were fantastic. Our guests said the fried green tomato hors d'oeuvres were the best! The staff was super friendly, professional, and courteous. We couldn't have asked for a better reception! Rocky Top catered our wedding with fantastic food and service. We worked with Kristen, and she was flawless! She went above and beyond to make our day perfect. She was very quick in responding to my many emails, professional, and everything we could have hoped for in a catering coordinator. The staff during our reception was incredible as well. Highly recommend Rocky Top for all of your catering needs! Ohmygod I have never enjoyed such good food. My husband and I went with some good old fashion BBQ from from their Southland menu. Really great!! We selected the biscuit bar (it's as awesome as it sounds) for cocktail hour, and did a buffet of pulled pork, chicken and waffles, green beans, and mac and cheese for dinner. The servers grab a plate for you and your partner so you don't even go up to the buffet. Every need was taken care of and they accommodated for my husbands grandparents who cannot walk very well. Would highly recommend this vendor. At the end of the night they even packaged up all our left over cookies (from another vendor) and two meals for my husband and I (which we enjoyed last night and it was still delicious!). We had Vicki as our contact and she was great to work with. Answered all of my questions and walked us through the entire process with ease. Even had recommendations for us when we asked. Vicki also came with us to CE Rentals to select plates and other utensils (its really nice because you don't have to worry about a second vendor. Everything for CE is paid through Rocky Top). Additionally they had the biscuit bar and drink table decorated rustically as well (wasn't just serving trays and plates). I wasn't expecting this at all, but I'm SO glad they did, it really pulled the space together. They really think of everything!! I wanted to give a special shout out to Cindy, a server who worked our event. She was so sweet and stopped my husband and I to wish us congratulations and compliment my dress. She was so so sweet and we talked to her more during the night. Really top notch employee and super helpful and prompt. Anything we asked for, she grab for us immediately - really made us feel like the top of her priorities. All the waiters were great , kind, and greeted us with smiles, but she really stood out to us as going above and beyond!! Rocky Top and Vicki, in particular, made our wedding reception sheer perfection! Vicki worked with my fiance and me on a menu that reflected our tastes and even created a whole need appetizer just for us and our big day. You won't regret booking this vendor! Amazing food! Everyone loved the food and the service! They even brought their own little decorations for the catering table. We worked with Vicki for both our rehearsal dinner and our wedding. Rocky Top and Vicki were incredible and went above and beyond to accommodate our requests. We wanted different menus for the RD and the reception as well as working around my food allergies. So many of our guests told us that the food was the best they'd ever had at a wedding! Thank you so much Rocky Top and Vicki Tong for making our wedding day incredible! We had the most wonderful experience with Rocky Top for our July 2018 wedding in Raleigh. Vicki was our catering contact, and anyone would be lucky to work with her! She nailed our menu after meeting with us once, and she was incredibly accommodating and so easy to work with throughout the whole process! She made everything less stressful. We could not have been happier with the food at our wedding. 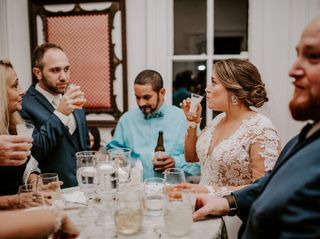 We had SO many guests come up to us after the wedding to say that the food was the best that they had ever had before at a wedding. Thank you to everyone at Rocky Top! We could not have chosen better for a caterer! Rocky top did a great job catering my daughter's wedding. Vicki Tong was fantastic! She made sure our menu was perfect. My daughter wanted family style and they did an awesome job. We received many compliments on the food and service. The wait staff was professional, friendly and always making sure everyone was taken care of. Vicki was perfect for day one to the big day! Always checking in on us. Rocky Top is the best around. 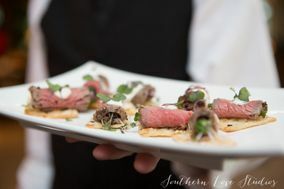 They have fun events leading up to your wedding where you can taste all kinds of foods & drinks. 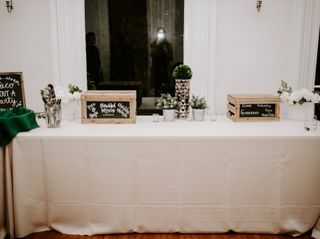 Our wedding guests raved about our food selection and they were super easy to work with. We provided our own alcohol (we had to get a liquor license) but their bartenders served it. The staff is very proficient, friendly, and great at what they do. If you value quality and want a caterer that is trutly in it for your event this is the one to book. Rocky Top catered my daughter's wedding recently at the NC Museum of Natural Sciences. They did a fantastic job! I worked with Jeff and he was very professional, personable, accommodating and responsive to emails. 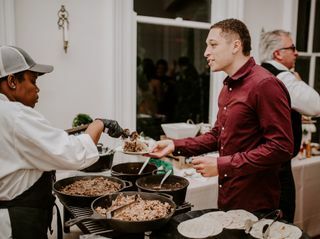 He went above and beyond to assist us in coming up with a menu that was pleasing to vegetarians and meat eaters alike (bride and groom vegetarian). During the cocktail hour we had a bruschetta bar and NC inspired passed hors d'oeuvres (crispy pimento cheese with smoked apple jelly, chicken and waffle bites, shrimp and grits). Our guests devoured them! For the buffet dinner we started with the green apple and bleu cheese salad, then enjoyed a buffet including crispy smashed potatoes (amazing! ), haricot vert almondine, bruschetta mac and cheese, sirloin carving station and vegetarian paella. Everything was so delicious. Rocky Top was happy to make the vegetarian paella vegan friendly for us and all the guests enjoyed eating it. It had a beautiful presentation and was served in a paella pan. I believe the chef had to go make more because it was such a hit with the meat eaters as well. All the food was very flavorful and the service was quick and friendly. They even packed up some leftovers for us! Although the museum only allows Rocky Top to cater, I would choose them to do the job regardless of the venue because of the outstanding customer service, taste, quality, value and willingness to accommodate dietary needs. Delicious! Lara was very helpful! She helped with the wedding dinner, rehearsal dinner, and helped pick out the place settings and table cloths. Jeff was awesome to work with! Vicki was our point of contact with Rocky Top Catering. We were recommended to her by our wedding planner. We were impressed with them right away, we wanted southern fare and they nailed it. Chicken and waffle hors d'oeuvres and pimento Mac and cheese, need I say more? 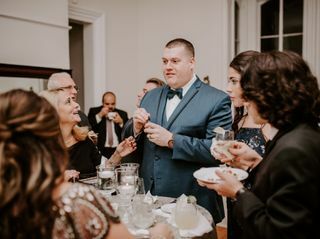 Everyone at our wedding complimented the food and bar service. They were professional and efficient. We couldn't have been happier. I would definitely recommend Rocky Top to anyone needing catering in the Raleigh area. Rocky Top catered out wedding and they were amazzzing. I had eaten Rocky Top’s food at someone else’s wedding and at the time thought it was the best wedding food I had ever eaten. I am so glad I snagged them for my day! Lara was wonderful to work with from the very beginning. She was very responsive and offered really helpful suggestions- which was great because I was kind of overwhelmed by the wedding planning! My husband and I attended an open house tasting and the food was phenomenal. Everything we selected to serve at our wedding was delicious and people are still talking about the bruschetta mac and cheese. I only wish we got to sit down and stuff our faces with it! Another reason we chose Rocky Top is because they set up the food in a pleasing way. We chose to do a buffet, and Rocky Top did a wonderful job with the signs, playing with height, ect. And made it seem so much nicer. Thanks Rocky Top! As if they even need another five star review. I just can't help myself from telling y'all that this catering company is the Dream Team! They went above and beyond for everyone on our wedding day. They were incredible. The food was great, but the service was just outstanding. We were thrilled with everything involving Rocky Top. I am so glad we chose Rocky Top as our wedding caterer! 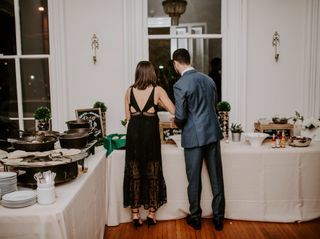 All of our guests raved about the food, and I'm still dreaming about the shrimp and grits even though our event was over a month ago. The service was incredible at every level. Lara helped us pick out the perfect menu, and even assisted with figuring out our floor plan for the reception. 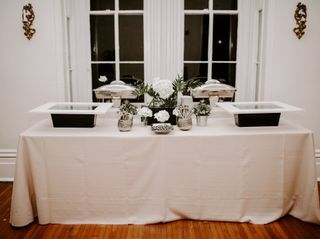 The stations were all set up beautifully the day of, and the staff ensured that the bride and groom actually got to enjoy the food! 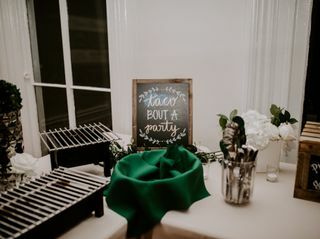 Not only did they bring trays of hors d'oeuvres and drinks down to the wedding party while we were taking pictures, they also asked what my husband and I wanted to eat and made plates for us to make sure we got to try everything! They also sent us home with some leftovers, which was wonderful. I would absolutely recommend them to anyone looking to hire a caterer. Vicki is absolutely incredible to work with! She truly made my husband and me feel like her only clients. Additionally, she has the patience of a saint. She was never "too busy" to answer a question in detail or text/call. She was always excited to see and talk to us if we ran into her at other weddings. She has an impeccable attention to detail and memory. The food is beyond incredible and we are so thankful that we did not go with another company. There are many catering companies that have good food, but none have the level of customer service that Rock Top Catering does. I am so glad that we chose Rocky Top for our December wedding! Jeff was wonderful to work with, he was always very patient and flexible. My husband and I had to bring our kids with us to the tasting event and all of the staff was so attentive to our kids, they didn't have to offer them food but they made sure our kids felt included. One waitress even went in the back and brought them out kids cups which was so nice. I highly recommend going to a one of their tasting events! It was so mucj more fun than we expected it to be! Then on the day of our wedding everything went perfectly! The food was absolutely amazing, all of the staff was so kind and helpful, and I couldn't have asked for a better experience! It was nice being a bride and not having to worry about anything as far as food and drinks were concerned because I completely trusted the caterer. Their set up also looked beautiful even though we had a buffet. We had a lot of children attending our wedding so Jeff suggested we do a kids buffet and it was a fantastic idea, I'm so glad we chose to do it! Rocky Top also provided us a bartender for the night, she was so wonderful, patient, and the drinks were delicious! I couldn't be happier! I highly recommend! We hired Rocky Top to cater our daughter’s wedding in December and could not have had a better experience. Kevin and, especially, Vicki were incredibly helpful and professional during the whole process of planning the menu. Beginning with the tasting, they really worked hard to create a menu that was exactly what we wanted, and within budget. But the most important thing was that the food was amazing! Seriously, it was so delicious! We got so many compliments from our guests about how tasty and well-presented it was! And the staff was unfailingly courteous, attentive and efficient. Vicki was such a joy to work with; she took such a personal interest in the whole event that we felt like we’d made a new friend by the time it was over! We would definitely hire Rocky Top again in the future.